You are not logged in. 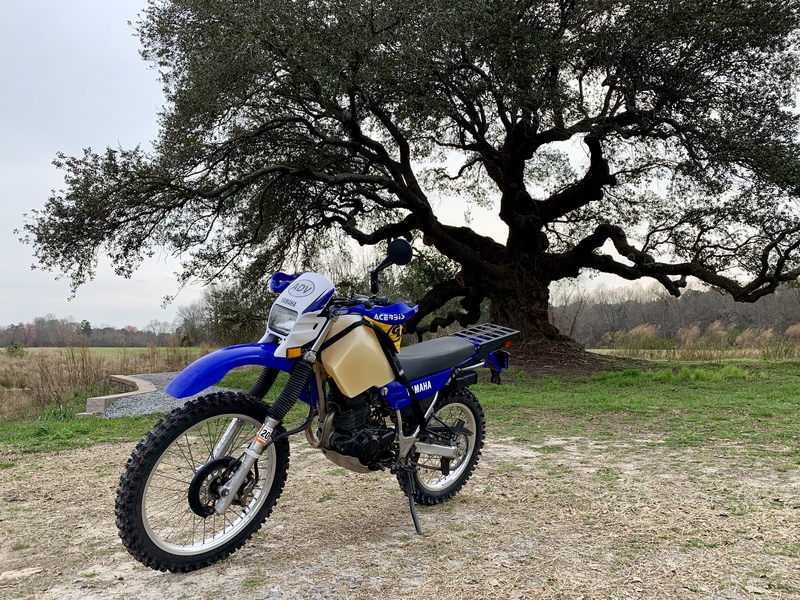 [Log In] XT225+250 Rider's Group » Forums » Classic XT225 & XT250 Stuff » Upgrade Projects » What did You do to Your Dual Sport today? I found a mud puddle on my way home from work. It's genuinely amazing how much better the bike looks with a bit of mud splattered across it. Apparently it's been a bit too long since I last got to play in the dirt. All the cleaning is worth it after a good day off-road. Last time out on the Serow The bike & me were caked in crud. Me above the knees on me boots & textile pants, had to hose them off, the bike took an hour of cleaning. I hadn't been anywhere off-road just the country lanes. They were covered in mud, cow crap, grit & that sticky molasses salt mix the councils spread for ice, sticks like crap to a blanket, everywhere. All that cleaning for a road ride. hi, while out for a short winters ride , I was practicing riding in rutts and promptly rode the bike and me into the hedge , more practice required I think! Going out tomorrow. Has been wet and cool here in Southwest (yes I know nothing like the rest of the country has endured) but we will have one day of 70 degrees. Jumping on the XT and taking a 70+ mile all dirt off-road ride. I rarely clean my toys as I prefer the dirt over water in seals & bearings. I do use a spray bottle & wipe off. Today I installed a Clarke tank onto my "01 XT225. I bought the tank last summer and finally got around to putting it on. It turns out that one of the brackets for the side cover was missing so I had to make one. Then the one for the other side didn't line up and I had to make some bends in it. The fit isn't to bad, I think I might have to tweak it a little. The forks just touch the tank when turned all the way to either side. The top part of the seat isn't quite flush with the tank. Not a big deal though and I'm quite pleased with it. It's not leaking and I think it looks good. I haven't filled it all the way up yet so I don't know how that will feel when riding it. I put on a new fuel line and added an inline filter to it. I don't know how necessary that is but did it anyway. I like having it there and the fuel seems to flow just fine so far. 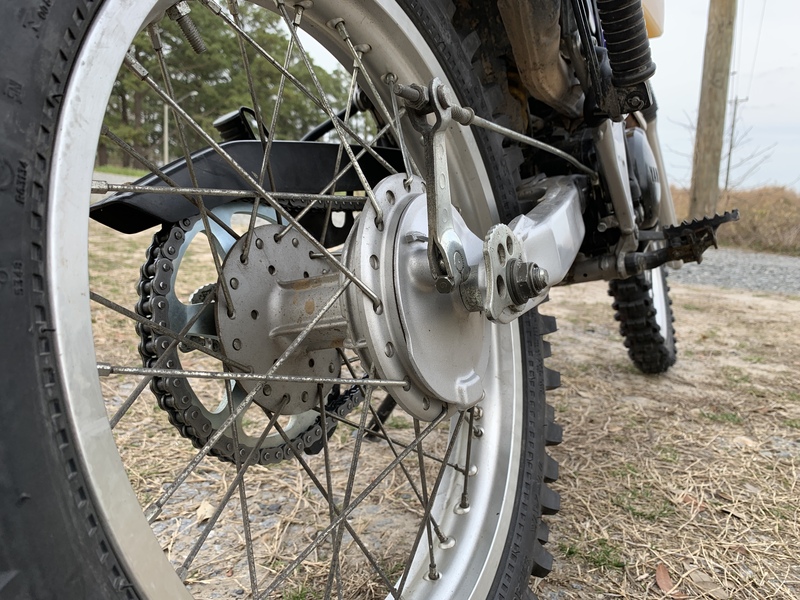 Just install Kenda Trackmasters, 15/50 sprockets, X-ring chain, removed the turn signals, and inverted the rear brake rod. Did the Z1 exhaust mod today, drilled it to 1-1/2”. I didn’t think the increase in noise was objectionable, and the engine certainly felt more peppy. Seemed like there was more tug on the handlebars when nailing the throttle, and pulled very well from low rpms. My bike originally had a 42.5 pilot and 130 main when I rebuilt the carb (previous owner did this in Alaska). I initially replaced both jets with new ones of the same size, but then changed the 130 main to a 127.5 and it ran fine. 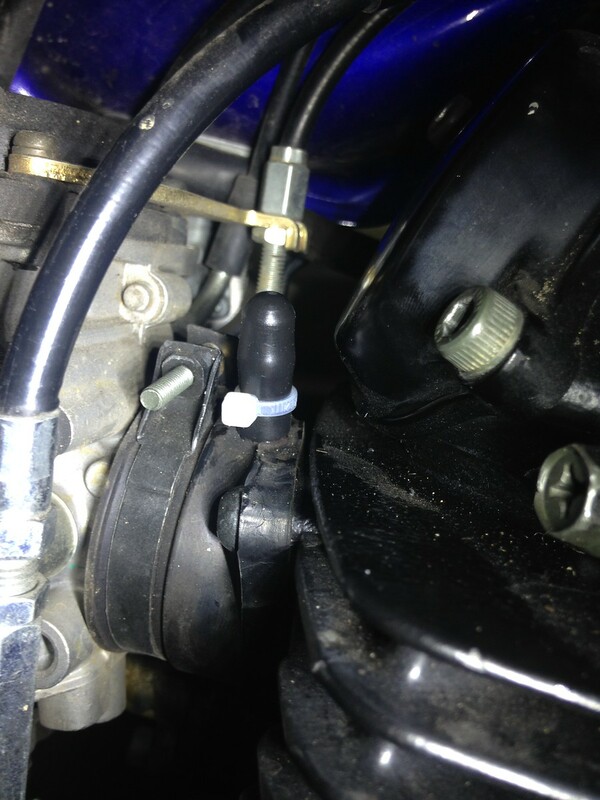 The bike has a K&N filter which feels like it is stuck, but I haven’t tried that hard to pull it out. 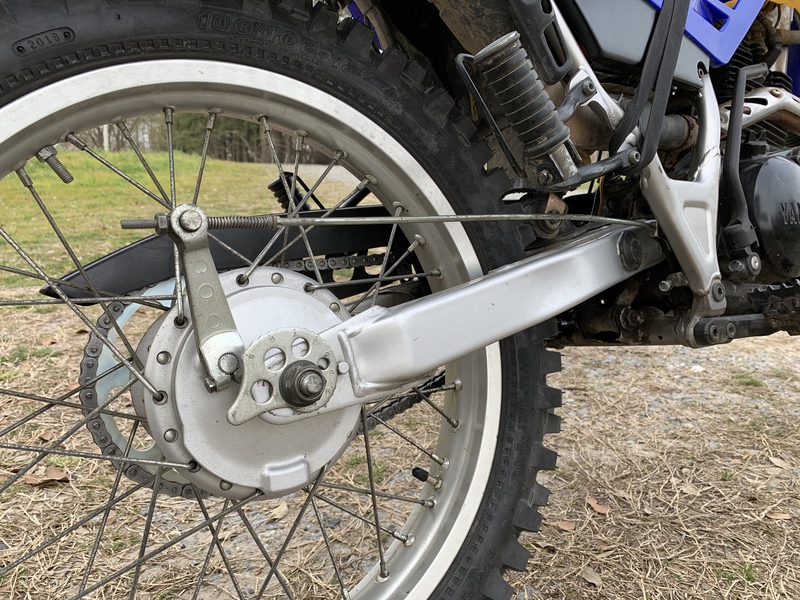 With the jetting, K&N, 15/50 sprockets, and now the Z-1 mod, the bike has more snap to it than expected for it’s displacement. I’m really pleased at how this little bike is coming together. Today I replaced the vacuum port cap on the carb intake boot. A few days ago it was nice so I rode to work. 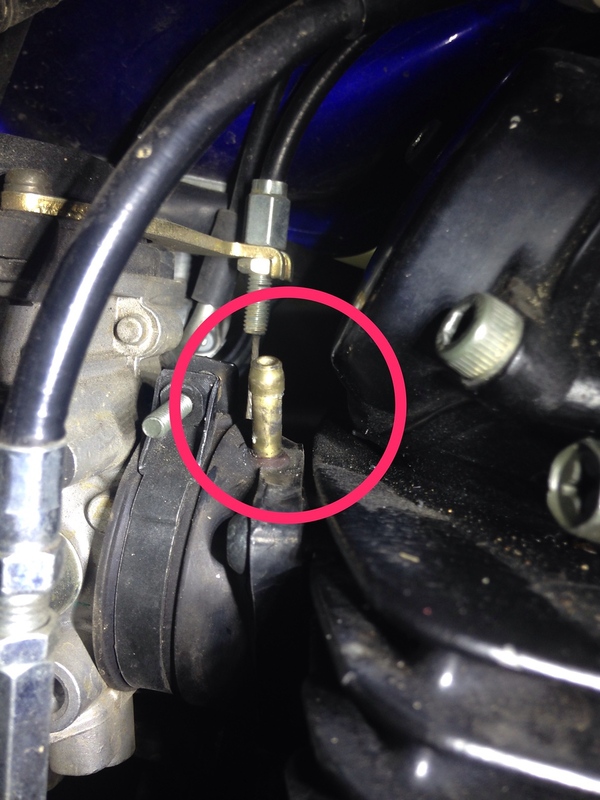 When I started the bike to go home, it made a little pop just as it fired and I could tell something was suddenly amiss in the fuel mixture. It popped a bunch while engine braking (which it very rarely does) to the stop sign a couple hundred yards away, and promptly stalled as soon as I stopped. It was unhappy about restarting, but finally did so with full choke. Same thing at the next stop sign. I switched to reserve with no effect and decided to stop at the gas station just up the road to see what I could see, and I needed gas anyway. In the couple minutes It took to get there, I got the idea that it was behaving as though there was a big vacuum leak. I wondered what could have broken. I gave it a look over at the gas station and thankfully I fairly quickly noticed the end of the brass vacuum port poking out. The cap had dry rotted and the tip cracked and fell off. Ah ha. That would indeed make for a big vacuum leak. So I dug around in my tail bag and found the roll of electrical tape I keep stashed in there. A couple minutes and a couple burned knuckles later, I got the port mostly taped over. The bike started right up and ran mostly normally the rest of the way home. I wasn't sure how long my tape job would last but it was still there and only a little melted when I got home. I happened to have a leftover plug from something else that fit, so I put a new one on. I'll also add this to my "replace annually" list with the fuel line, filter, brake fluid, etc. A true backfire with the throttle closed has got to be a lot of pressure, and I've had them blown off so it's good to check them annually. Generated in 0.039 seconds in which 0.027 seconds were spent on a total of 16 queries. Zlib compression disabled.